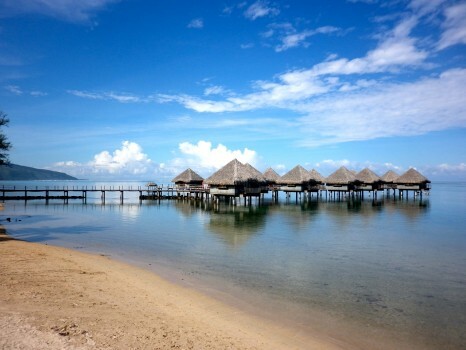 Tahiti…the name says it all right? 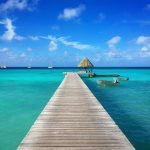 Tahiti is a magical sounding word that brings about thoughts of an exotic paradise but make no mistake, Tahiti is not what you’ve seen pictures of or dreamed about. Tahiti is a nice enough place to be but it is the largest island of the country of French Polynesia and home to the bustling and traffic ridden capital of Pape’ete. Pape’ete is only an 8-hour flight from Los Angeles and it is on the Unites States’ side of the International date line. It is actually on the same time zone as Hawaii. Jet lag is not an issue and Air Tahiti Nui is a good airline with a decent entertainment system in coach to help pass the time. 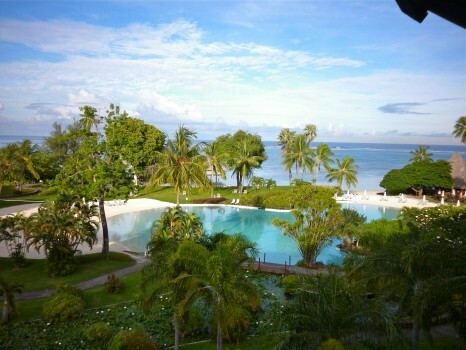 Tahiti boasts a beautiful, mountainous, green interior filled with archaeological sites, waterfalls and hikes. It also has some of the best surfing in French Polynesia. However, most people will never see these things. 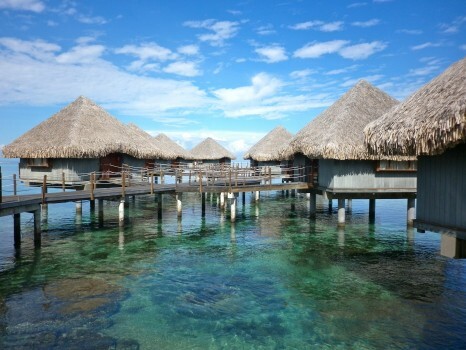 Unless there is a need to stay over at one of Tahiti’s very fine hotels; most tourists will head straight out to Mo’orea, Bora Bora or another island as soon as possible. I had heard all of these things before I came down to French Polynesia. 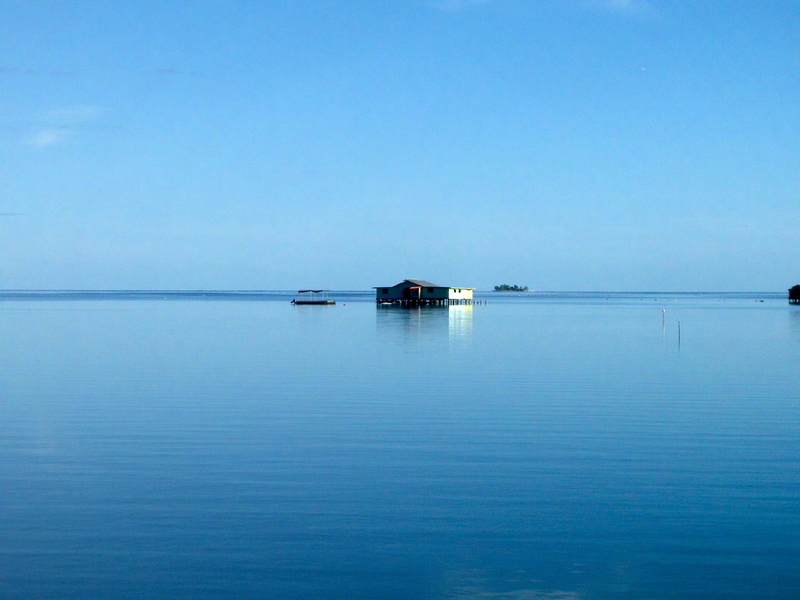 Hearing all that negative stuff made me manage my expectations and actually enjoy my time here on Tahiti. I always try to find the good in places and take them for what they are. 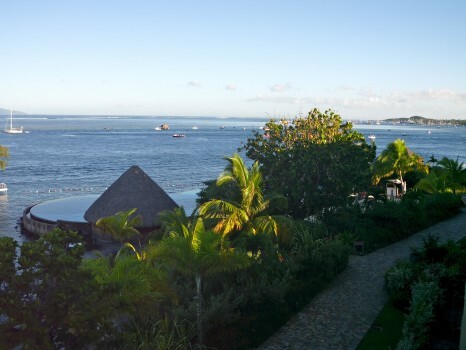 Tahiti is no different and very pleasant place to be. I am not going to sugarcoat it. It’s nothing like the aforementioned resort islands. 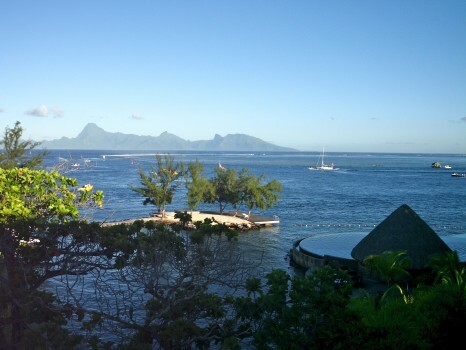 There are some very nice hotels but Tahiti is very much a place that tourists pass through and centered on Pape’ete. Pape’ete is a decent enough place to be for a few hours as there are many shops, stores and cafes. There is also supposed to be some excellent nightclubs but I didn’t get a chance to check those out. If you listen to the locals, they talk about the nightlife like it’s Las Vegas or Miami. 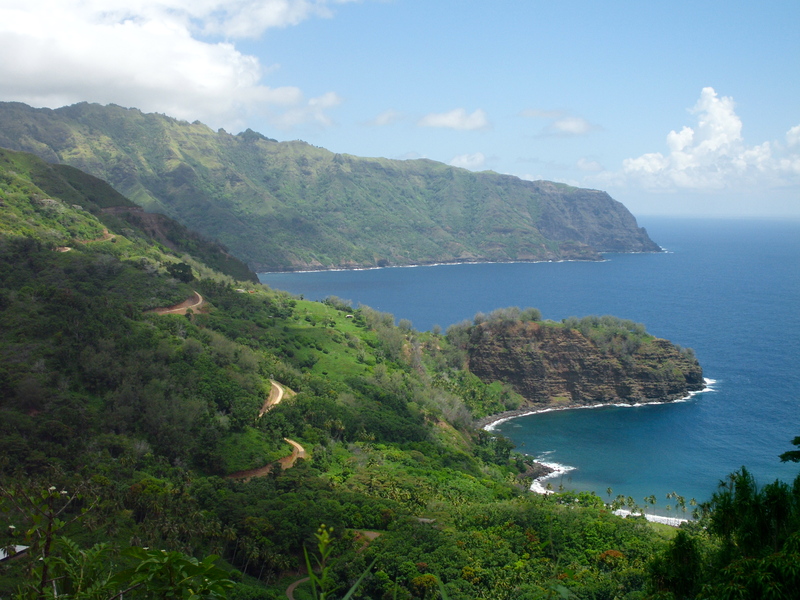 But for me, I basically sat in a traffic jam in Pape’ete and got out for a little walk around. 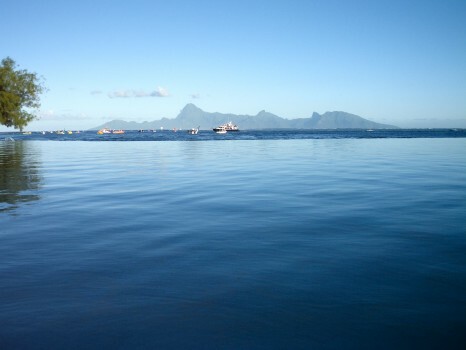 It is also where I caught the ferry to Mo’orea. 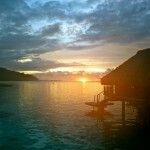 I stayed at two pretty nice hotels on my two nights on Tahiti. 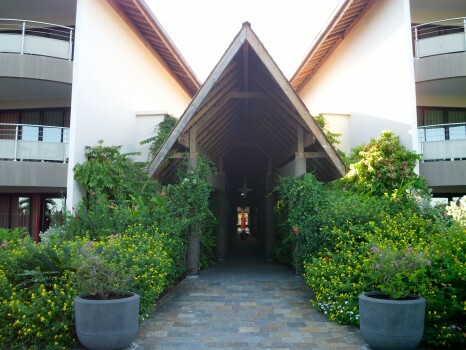 Both nights were as a layover essentially at the gorgeous Le Meridien Tahiti and the Manava Resort. However, instead of just eating at the fancy hotel restaurant, I decided to head out for dinner at a local food stall gathering place. It was awesome. 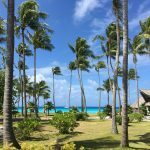 This was a great decision as it gave me a real perspective on the actual Tahitian people, not just the ones paid to be nice to you at the hotels. 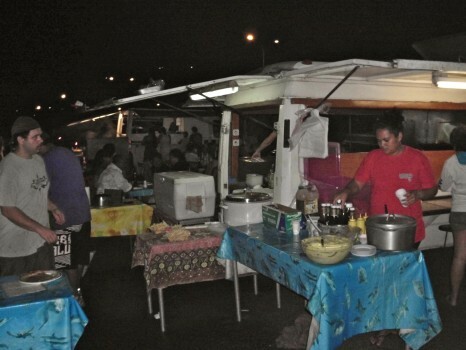 These particular food stalls were recommended by my driver; who was the same lady who drove me both nights I stayed on Tahiti. 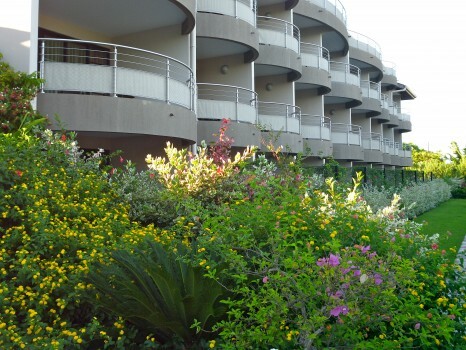 She said they were the best on the island and a 3-minute walk from the Manava Hotel. I asked her which one she recommended. Her reply was in typical Tahitian fashion, “whichever one has the most people”. I guess I can’t really argue with that logic! So I peeked around at all the different options. 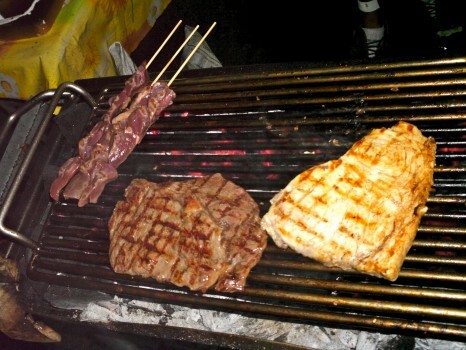 Some had crepes and pizza believe it or not but most had meat, fish and chicken or some combination thereof. I opted for the one with the most locals (there must’ve been 25) sitting down at the plastic tables and chairs laid out around the stall. This place served up steak, fish, chicken and all kinds of different island salads; all with huge helpings of fries or rice. I don’t like rice much unless it’s in sushi but I love fries. 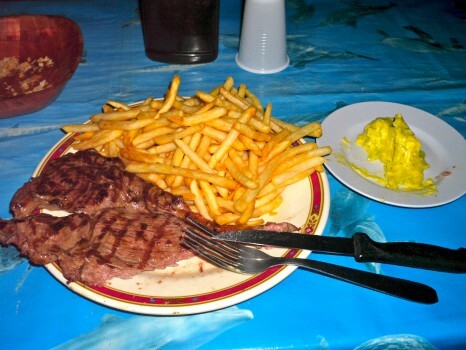 Throw some delicious steak with roquefort sauce in the mix and I am really happy. Finally, add in this delicious island garlic butter they whip right there on site and I will go to sleep fat and happy (as I did as soon as I finished writing this). The only issue I had was that the guys taking the orders at the carts didn’t speak much English. My OK at best French in a terrible accent is not what they’re used to. I luckily got assistance communicating from a local man sitting with his family. As usual, things fell into place for the best. After I placed my order, he offered a seat at his family’s table and I gladly obliged. The kids didn’t speak great English but from him and his wife I got a lot of insights into Tahiti and what it’s like to be French Polynesian. Mainly, French Polynesians hate their politicians…a lot! Sounds like America! It was a really fun time and I did manage to finish most of the massive serving you see above. I must say it was actually really nice though to get a big serving. 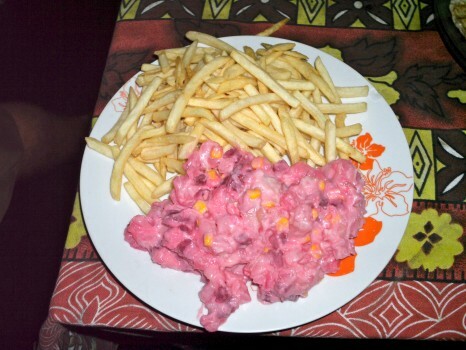 Generally when you travel, especially in French territories you get miniscule portions. I have no complaints and it tasted just as good. 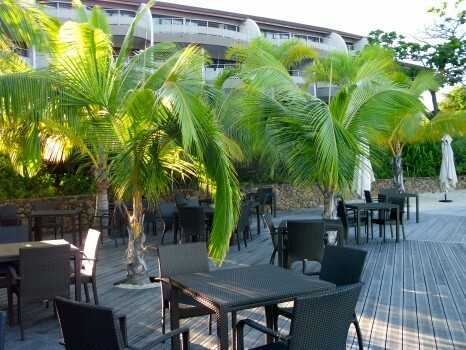 Now I am back at the Manava Hotel; which is really nice and I will be picked up in the early morning to fly to the Marquesas Islands. I cannot tell you how excited I am to get up there to the islands at the end of the world. Funny, I didn’t know that Tahiti wasn’t the name of the country. This is why I read your site…I learn so much! LOL…and I know you hate when people wrote LOL! I do but it’s OK…it’s all good in the Marquesas! It looks quite nice to me Lee! It is nice Harini, just not what you might expect. It’s not Moorea or Bora Bora or one of the islands that you’ve dreampt of your whole life but it’s definitely nice and I had fun. I actually have one more night there as well in 2 days I am looking forward to before Pitcairn Island. How are you getting to Pitcairn? I’m heading there on the Xplore in a weeks time, leaving from Mangareva. I’m looking forward to your thoughts on the island. Hopefully the rains they’re currently experiencing clear up! 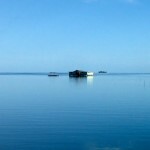 Hey Chris, I am leaving from Mangareva for Pitcairn in 2 days and arrive back in Mangareva on the Xplore on April 17th! 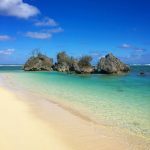 I am sure I will see you at the port…well actually I’ll probably see you at the airport because I will be leaving Mangareva on the flight you’re coming in on as there’s only the one a week…that’s funny but I look forward to meeting you hopefully. I’ll be the tall American guy with the Yankees hat. I will be sure to write a lot about it though and have tons of pictures and videos as you will I am sure. Haha, great, Iook forward to hopefully meeting you at Mangareva. 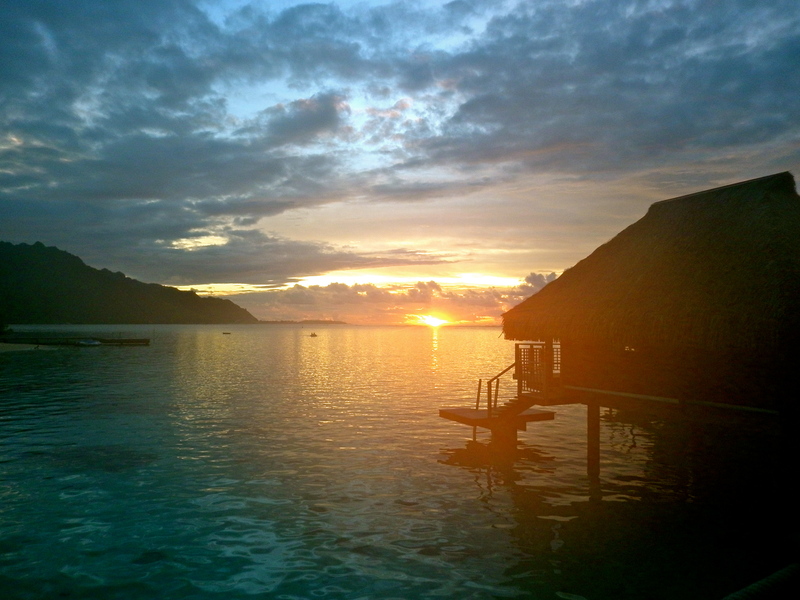 I’m heading to Tahiti in a week so your writeup of Tahiti was very timely for me! Haha, yes it does kind of but they taste good as hell, trust me! Go to bed! 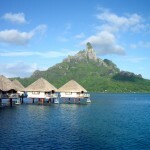 I agree about Tahiti not being as good as the other resort islands. 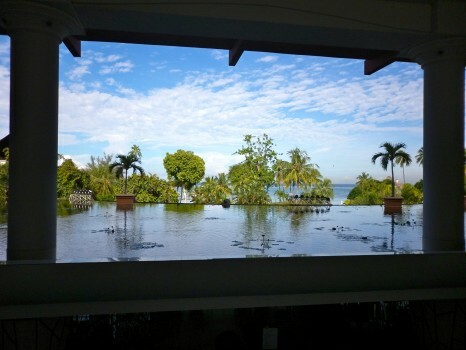 I also agree that it is still beautiful and quite a nice place to be for a holiday. 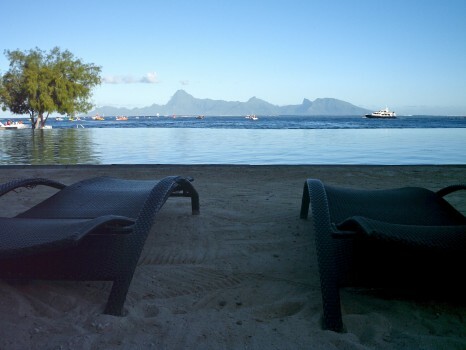 My former boyfriend and I went to the Le Meridien Tahiti and loved it. Unfortunately for him, he was a wanker but I do fancy another trip down to Tahiti. Thanks for bringing back a nice memory. Haha, well since a majority of my audience is American, they likely won’t understand the negative significance of the word wanker so I won’t edit that but I did just laugh out loud when I read this! Glad I could help you bring back some clearly fine memories! Ya I’ve been to Birmingham and I agree but at least I hope Aston Villa doesn’t get relegated so you’ll have something! Despite all the negative press about Pape’ete, judging from your pictures Tahiti still looks like a paradise (the turquoise water tells it). By the way, I like the new look of your website. Looks fresh! Once again, a fabulous account of your never-ending travels. I always check this website out to see what you’ve been up to. Great reading. The food cart looks awesome and so does that picture of the infinity pool going into the water. That’s a real nice shot. Have a safe trip. Lee, as usual, neat post. I am with you on finding the good of any place I go. It really is about what we make out of the places and experiences and no matter “how bad” a place may be, there is learning even in that. Cheers, mate!